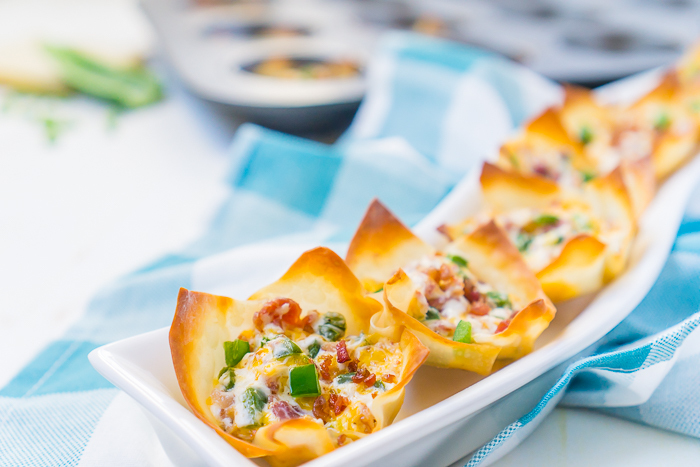 All the tasty goodness of Bacon Jalapeno Poppers inside an easy baked wonton cup! These bite size poppers make the perfect appetizer for your next party or game day celebration. You’re friends and family will love them! These Easy Jalapeno Poppers in Baked Wonton Cups are a Crowd Pleaser – Especially with Bacon Involved! I’ve decided I’m a huge fan of baked wonton cups for appetizers! I first used them with my BBQ Chicken and Pineapple Wonton Cups and now here they are again with these Bacon Jalapeno Popper Cups. They are really easy to make, they turn a gorgeous golden brown color and they have the perfect crisp! Plus, with a very neutral flavor, the options for these wonton cups filling is endless! 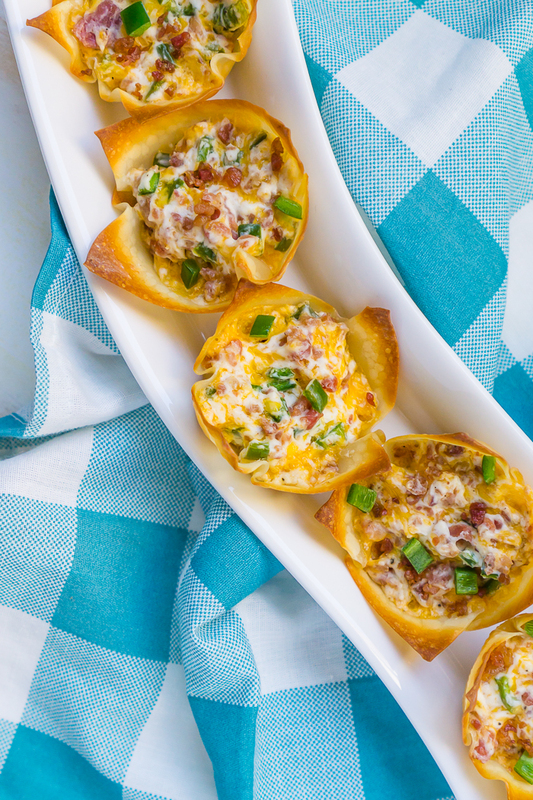 For these baked wonton cups, the filling consists of fresh jalapenos, cream cheese, cheddar cheese, sour cream and bacon! If you don’t normally cook with jalapenos and worry these are spicy, they are not. I did not grow up with my mom cooking with jalapenos at all, but now I am a huge fan of creating recipes with jalapenos. My favorite probably being my Cranberry Jalapeno Cream Cheese Dip! All the strong heat in jalapenos comes from the seeds, so I always remove the seeds when cooking for a crowd. What’s left is a mild heat that pairs well for most people with a creamy base like cream cheese and sour cream. Now, if you want your recipe to have more heat, you can always leave in the seeds. 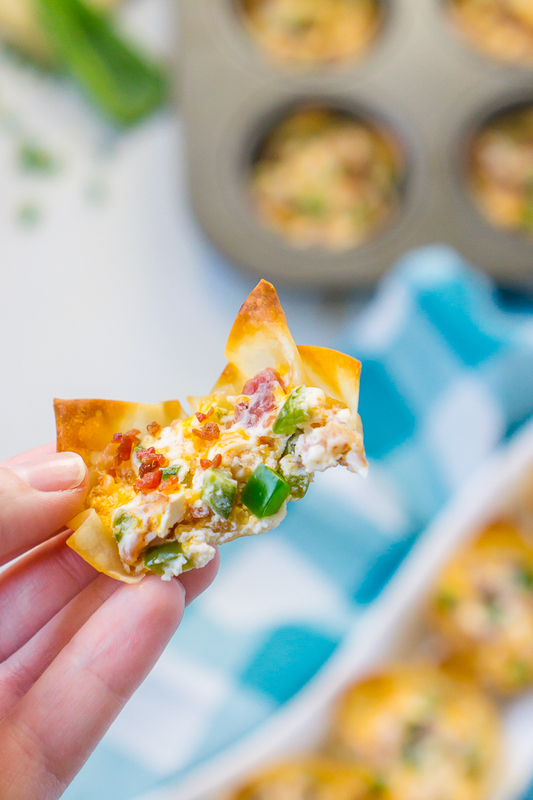 My husband and I made these jalapeno popper wonton cups for the last championship football game before the big game. Bryan’s team – the Vikings – were playing, which means the whole family was watching. I’ve talked many times on the blog before that for me, football Sundays is about the food, so I whipped up a lot of fun new recipes for us to try, including two new meatball recipes – Buffalo Chicken Meatballs stuffed with Blue Cheese and Honey Sriracha Meatballs – and these cups. The game did not go Bryan’s way at all, but we did love all the food! To start, you will need a muffin pan, cooking spray, and wonton wrapper sheets. I always find mine in the produce section, usually on the main refrigerated produce wall. Prep each muffin cup on the pan with cooking spray. You don’t want to over spray, but make sure you have covered the bottoms and sides. Place one wonton sheet into each cup. Gently push it into place against the bottom and then fold over edges on the sides, slightly overlapping corners for it to fit into the round cup. You can see below how each cup is folded into place a little differently. The goal is to just make sure your sides are covered enough for whatever filling you place into the cup. Some people like to precook their cups before the filling. I don’t find that extra step necessary. Instead, I immediately fill them after prepping the cups and bake at 350 F for 8-10 minutes. To remove the cups, use a fork or carefully lift the cup up from on of the baked points. The cups have always slid right out for me. 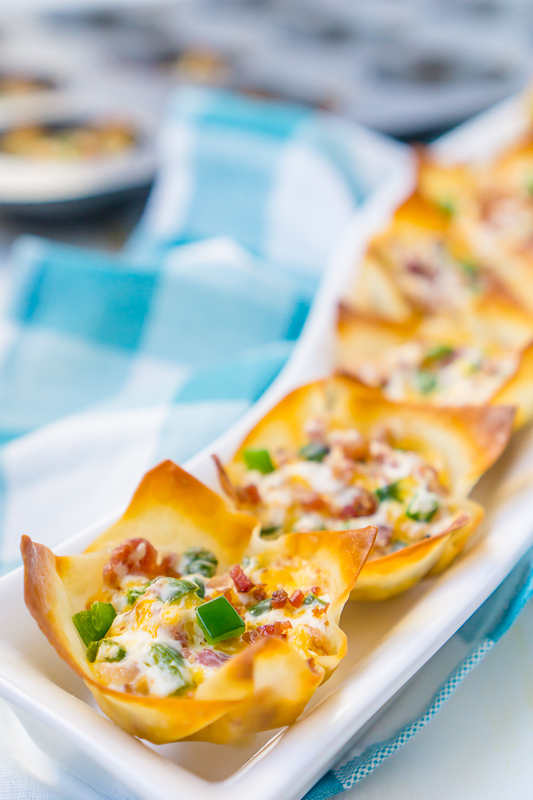 Time to Mix Together These Baked Bacon Jalapeno Popper Wonton Cups and Enjoy! 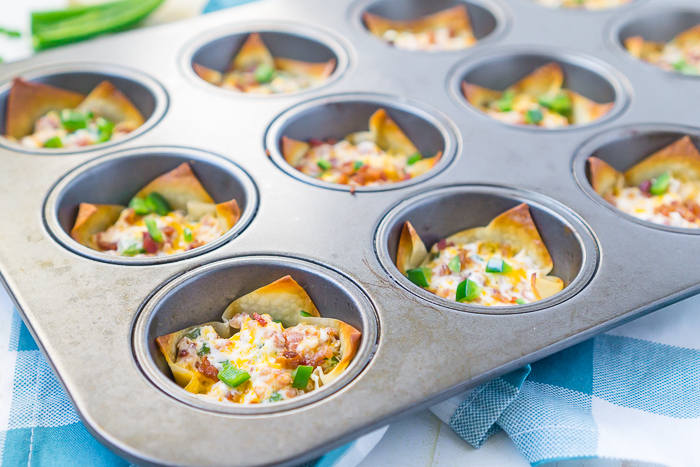 All the tasty goodness of Bacon Jalapeno Poppers inside an easy baked wonton cup! Fresh jalapenos, chopped bacon, cream cheese, cheddar and more! These are going to be a big hit! Spray each muffin cup with cooking spray. Then place one wonton wrapper into each muffin cup with corners slightly overlapping. In a medium mixing bowl, combine the cream cheese, sour cream, bacon, cheddar cheese, and diced jalapenos. Stir until well combined. Add filling to the prepared wonton cups, Garnish with additional bacon or cheddar cheese if desired! Bake at 350 F for 8-10 minutes until the cheese is melted and the edges of the wonton wrappers are golden.